All of the seven Chinese women booked a place in the fourth round of the singles event at the World Table Tennis Championships in Rotterdam on Wednesday evening. Top seed Li Xiaoxia beat Kim Jong from DPR Korea 11-6, 11-9, 12-10, 11-5, while Guo Yan (2) needed five games (12-10, 11-6, 7-11, 12-10, 11-5) to defeat Sun Beibei from Singapore. Guo Yue (3/4) beat Gabriela Feher from Serbia 11-5, 11-6, 11-1, 11-4 in twenty minutes and Ding Ning (3/4) used 24 minutes to knock Beh Lee Wei from Malaysia out of the tournament (11-9, 11-2, 11-7, 11-9). Fan Ying caused a surprise by defeating Japan's Ai Fukuhara (5/8) 8-11, 11-7, 12-10, 11-8, 11-7. Fukuhara aimed for a medal at these WTTC and was clearly disappointed. "I'm not satisfied with my performance but I didn't play badly," the Japanese player said. "I met Fan Ying in Poland this March and I lost after 20 minutes. This time, I just encouraged myself not to give up. I expected to grab a medal in the singles. Although I failed, I can face it. I will try even harder in the women's doubles and mixed doubles events." 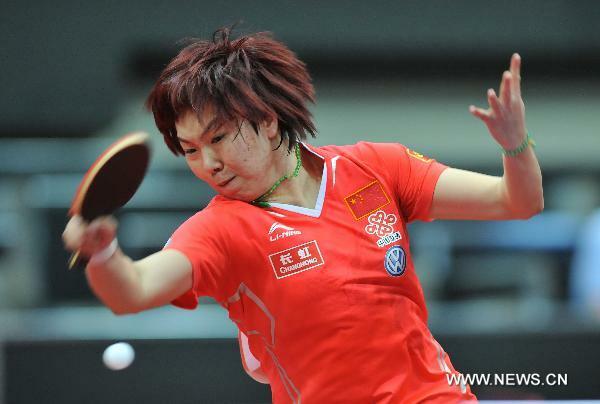 Another surprise was Shen Yanfei's win against Li Jiao. The Spanish woman beat the Dutch woman 11-4, 12-10, 8-11, 12-10, 11-4. Li Jiao could not find an explanation right away. "Maybe it was pressure," she said. "But I find it very difficult to answer that question right now. It just happened. I need to think about it and then I might reach to a conclusion. Now I can hardly say what I have done wrong. Actually I was not nervous and well prepared. At noon, I was still able to rest in the hotel. Unfortunately, today I could not bring my own game. I was not really relaxed." Wu Yang advanced via Li Jiawei from Singapore (11-4, 11-4, 11-3, 11-6) and Liu Shiwen beat Li Qian from Poland 11-9, 11-4, 11-8, 11-7.